It has been a strange few days. We are about the furthest we have been from anything, ever, in the middle of the Atlantic Ocean, and yet we have become embroiled in sad events that we understand are being broadcast widely by the international news media. As a result, these last few days have been some of our busiest, with a flurry of contact over the sat phone. Sadly, six days ago, the Cheeki Rafiki sank. The details of this I’m sure you’re all familiar with by now (perhaps more so than us, with limited access and four/six-hourly updates from a few sources), so this post will only be a short update from our perspective. After diverting ourselves well to the north of our course, two days ago (I think…times and days are a little confused with our watch system), we arrived in part of the designated search area for the vessel. Normally we have at least one person on watch and theoretically a second person on standby. In reality, the second person is usually dozing or sprawled out below deck on top of a bagged sail. Of course now that we are searching for Cheeki Rafiki we always have a minimum of two sets of eyes keeping an eye out, whilst the others glean some rest or supply tea and ginger nuts. In the large part, conditions have been good for the matter at hand, with little swell, (mostly) pleasant weather and good visibility. Every so often a piece of plastic will bob our way, but so far nothing that looks fresh (it’s pretty easy to tell, with a layer of green slime on the stuff that’s been around here for a while). It really is surprising to me how much there is bobbing around out here. Our only bad weather came last night. 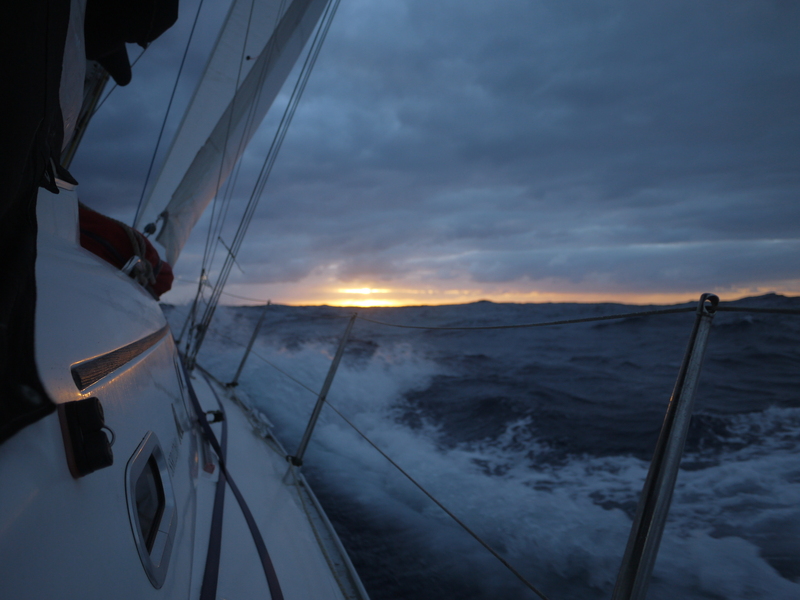 We had dropped sails and slowed to 4(ish) knots in the hope that we would just drift around slowly in the search area throughout the night, so as to reduce the likelihood of missing anything. Of course we kept our watches, quietly sat opposite each other and staring out into the distances. Visibility was poor last night, with no starlight, no moonlight and a close fog. The rain came in pretty hard as well, and a large swell tossed Gertha about throughout the night. All in, conditions were horrible, difficult and, to be frank, upsetting. The night was a really long and difficult one, much of which was spent with my soul clenched against the night, praying that by some stroke of immense luck our navigation lights would become a beacon and some flares would be sent up. The night at sea presents an infinity of odd forms and I found myself trying to will them into some useful shape or clue. It is the same in the day: anything that passes by we scrutinise and hope that it will be some part of a trail that leads to the missing crew. Nothing yet. I know a couple of the crew have had vivid dreams of finding the missing crew. And as I think about it now, these are all signs that we are living in hope, that we want more than anything to cross paths with some useful information, or better. As I finished my watch last night I was glad to get out of my sopping gear and into bed, but sleep didn’t come easily. I found myself thinking about the crew and trying to assure myself from the scant information that we have that they had made it into the life raft and are somewhere nearby some other boat, a short period of time from being found. They are, essentially, hopefully (in a difficult way), living through my nightmare. I have even found myself praying and trying to talk to them. This is not normal behaviour for me. I am in a strange place, that I am on a deep level terrified of. The passage so far has been a blast for us, a dream. The sinking of Cheeki Rafiki has brought into perspective some difficult truths about life at sea which I’m not sure I can articulate here. Emma and I have been thinking a lot about our families (in reality, our big family) and, of course, the families of the crew of the Cheeki Rafiki. If I could speak to them I would like them to know that we are hurting for you. We think of you often and we are spending our long hours out here being as practical and useful as we can, and in a hopeful state of mind. Our skipper and Mauritz are experienced sailors and have been guiding Emma and I well. They have made certain that we are now in the search area and we will spend as long as we can out here, looking for your loved ones. Gertha is a small vessel, and we are on limited provisions, but please rest assured that once we leave there are others from the ARC rally behind us, and we have been informed that they will be joining the search too, which was headed up by Malisi. It’s a big ocean, and we are a small boat, but this morning we awoke to perfect conditions. The sun is out and visibility is great, and we have a long day of searching ahead of us. Yesterday afternoon we saw a US coastguard aeroplane flying a pattern out here, and a merchant vessel on the lookout too. Hopefully soon we will hear of or have some good news to report. In the meantime, we continue on in hope. P.S. This post has only been posted because Paul back home has made it possible. We don’t have the facilities to blog from Gertha. Thank you, Paul, for your help (as ever)! This entry was posted in travel and tagged Atlantic Crossing, Cheeki Rafiki. Bookmark the permalink.